Celiac.com 01/07/2017 - Crackly top, fudge and moist inside with an exquisite chocolate red wine ganache that will please the most refined taste buds! In medium saucepan heat cream to just boiling. Remove from heat. Add chocolate chips. Let sit for five minutes. Whisk until smooth. Add wine. Whisk to combine. Preheat the oven at 350 F(180 C). Prepare a 9×9 inch (22×22 cm) baking pan by spraying with nonstick spray, and then lining with parchment paper leaving excess hanging over two sides of the pan. In a small bowl, whisk flour, salt and cocoa. Set aside. In a double boiler, melt chocolate chips with butter and instant coffee until smooth. When melted, remove from heat and add sugars. Add 3 eggs to the chocolate mixture until well blended.Add the remaining eggs, vanilla and wine. Do not over mix. Add dry ingredients and walnuts to the chocolate mixture and fold with a rubber spatula. Do not over mix. When there are still a few small lumps of unmixed flour and cocoa powder visible, stop mixing. Pour the batter into the prepared baking pan and bake for 25-28 minutes, or until a toothpick inserted an inch away from the center comes out clean. 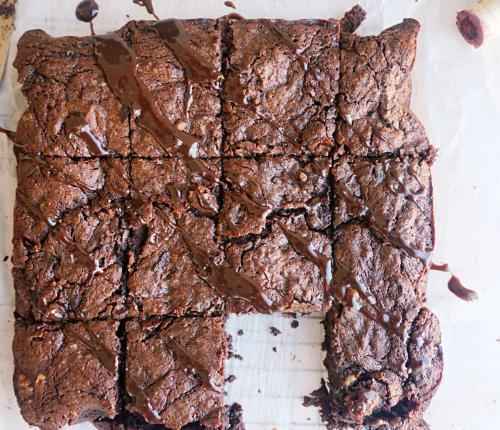 Allow the brownies to cool slightly before you drizzle the chocolate wine ganache. Let them cool completely and then lift them out of the pan using the parchment paper. Cut into bars. Professional cook, food blogger, Greek mom and celiac patient for over eleven years. I've studied Hospitality and Culinary Arts and have a certificate in HACCP. Also, I worked at five star hotels as well as upscale breweries. This recipe comes to us from Joanne Rogers. Mix margarine and sugar together; beat in egg and vanilla. Mix in dry ingredients followed by milk, then finely chopped rhubarb. Pour into greased pan then sprinkle mixed topping on top. Bake in 9x13 inch pan at 350 degrees F for 35-40 minutes. Half this recipe works well in an 8x8 inch pan. This recipe comes to us from Diana Brown. Preheat oven to 325F. Lightly butter the inside of a 10 inch round cake pan. Line the bottom pan with parchment paper or wax paper. Melt choc with coffee over simmering water bath. Meanwhile whisk together eggs and sugar. Also whisk over water bath until mixture is warm to the touch and sugar is dissolved. Place in mixing bowl and whip until tripled in size, reduce speed and whip for another 2 minutes. Fold egg mixture into choc mix 1/3 at a time, and then fold in whipped cream in same manner. Transfer to prepared pan and tap the pan lightly on work surface to settle any air pockets. Smooth top. Place pan in a larger baking pan and put in enough hot water to come ½ way up the sides of the cake pan. Bake for 50-60 minutes releasing any steam in oven about ½ way through. Cake should be somewhat firm in the middle. Turn oven off and let cake cool in oven for 2 hours. Carefully un-mold cake on to serving plate. Cut cake with a hot knife. 1 cup packed brown sugar In medium bowl, combine flour, sugar, 2 teaspoons cocoa, baking powder and salt. Stir in milk, oil, and vanilla until smooth. Spread in an un-greased 9x9 square baking pan. Combine brown sugar and remaining cocoa. Sprinkle over batter. Pour hot water over all. Do not stir! Bake at 350F for 35-40 minutes. Great slightly warm, topped with Cool Whip or ice cream. Cook milk & rice flour in a large bowl in the microwave, stirring often, until very thick--about 5 minutes and let cool . Cream shortening and margarine and add sugar, beat until it is no longer grainy. Add cooled glop and beat until very fluffy. Makes about 4 cups.